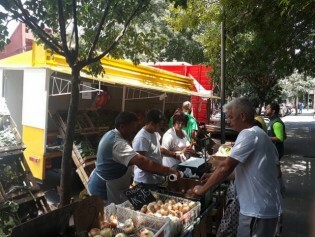 "Our philosophy is based on two principles: zero tolerance of pesticides or bosses," says Leandro Ladrú, while he puts tomatoes and carrots in the ecological bag held by a customer, in a large market in the Argentine capital, located between warehouses and rusty old railroad cars. Rocks, once a hindrance since they reduced arable land, have become an asset. Pedrina Pereira and João Leite used them to build four ponds to collect rainwater in a farming community in Brazil’s semi-arid Northeast. "Now we live well," say both Givaldo and Nina dos Santos, after showing visiting farmers their 1.25-hectare farm in Brazil’s semi-arid Northeast, which is small but has a great variety of fruit trees, thanks to innovative water and production techniques. Cattle ranching has been severely affected by drought in Brazi's Northeast region, but it has not only survived but has made a comeback in the Jacuípe river basin thanks to an optimal use of water. A paradigm shift is needed regarding how food is produced, consumed and marketed in Latin America and the Caribbean, in order to curb health problems related to poor nutrition. Víctor Rodríguez arranges lettuce, broccoli, potatoes and herbs on a shelf with care, as he does every Sunday, preparing to serve the customers who are about to arrive at the Alternative Market of Bosque de Tlalpan, in the south of the Mexican capital. The fight against hunger has been “remarkably successful” in Latin America and the Caribbean, but “it is a crime” that 35 million people still go to bed hungry every day, FAO regional representative Julio Berdegué told IPS. Sunita Daniel remembers what the school lunch programmes were like in her Caribbean island nation, Saint Lucía, until a couple of years ago: meals made of processed foods and imported products, and little integration with the surrounding communities. In the past, all rural homes in Cuba had gardens for putting fresh vegetables on the dinner table. The local term for these gardens is “conuco”, a word with indigenous roots that is still used in several Caribbean nations. Terrace farming as practiced from time immemorial by native peoples in the Andes mountains contributes to food security as a strategy of adaptation in an environment where the geography and other conditions make the production of nutritional foods a complex undertaking. "Who is more concerned than the rural family with regards to preservation of natural resources for future generations?" It does not make the headlines, but 2014 is the International Year of Family Farming (IYFF) and family farming will be centre-stage at this year’s World Food Day on Oct. 16 at the Food and Agriculture Organisation of the United Nations (FAO).